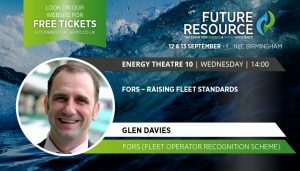 Join FORS at the UK’s leading event for water and energy efficiency, Future Resource, on Wednesday 12 and Thursday 13 September at the NEC, Birmingham, where FORS Technical Adviser, Glen Davies, will be speaking on ‘FORS – Raising Fleet Standards’ on the Thursday. As an added bonus, this year’s event will run side-by-side with four other leading environmental exhibitions – with every Future Resource visitor having full access to the neighbouring RWM Exhibition, Contamination Expo Series, Marine & Coastal Civil Engineering Expo and Flood Expo. FORS will be presenting from 14:00 to 14:30, followed by a 10 minute Q&A session. We hope to see you at the event. To find out more, and to order your free tickets, visit the Future Resource.